Barcelona continue their commitment to gender equality in football with their #wearefootballers campaign on International Women’s Day. BARCELONA, Spain — England international Toni Duggan has set her sights on playing at Camp Nou after scoring in Barcelona’s win over Atletico Madrid at the weekend as a new world record attendance was set for a women’s club game. Barca’s 2-0 success at the Wanda Metropolitano was watched by 60,739 supporters as the Catalans cut Atletico’s lead at the top of the table down to just three points with six games remaining. Duggan came off the bench to score the second goal after Asisat Oshoala broke the deadlock. Duggan scored two more on Wednesday as Lluis Cortes’ side beat LSK Kvinner 3-0 in the first leg of their Champions League quarterfinal tie at the 12,000-capacity Mini Estadi. Barca are now within reach of the semifinals, which could provide an opportunity for them to cross the road and play at Camp Nou. “It was amazing,” Duggan told ESPN FC about playing in front of the world record crowd. “It was unbelievable to play in such a stadium. “Atletico gave us a platform to play on and the supporters really got behind their team. The atmosphere was incredible. To be a part of that, to make history and to score a goal as well was a dream come true. Barca’s home stadium is the biggest in Europe, with a capacity of 99,354 and a match there could offer the opportunity to break the world record crowd for a women’s international match, with 90,185 people in attendance for the 1999 World Cup final between the United States and China at the Rose Bowl in Pasadena. “It would be amazing to play there [at Camp Nou],” Duggan added. “I think every single one of the girls and the coaches would say the same. 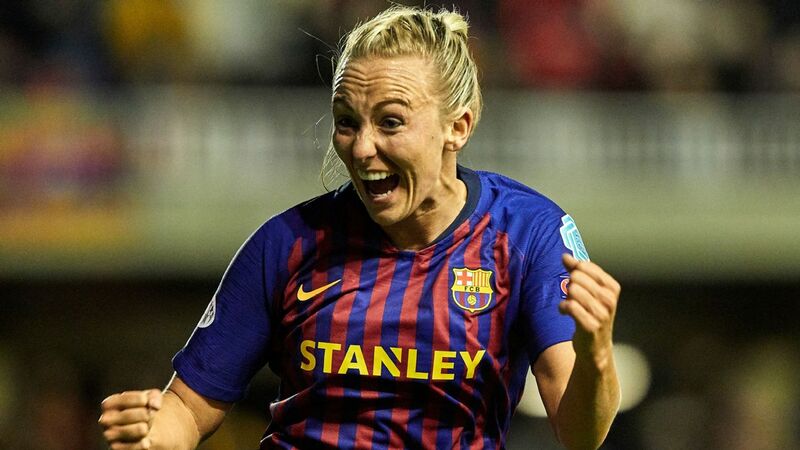 Toni Duggan celebrates after scoring Barcelona’s second during the 3-0 victory over LSK Kvinner in the Champions League quarterfinal first leg. The record crowd at the Wanda on Sunday has brought a wider focus back on to the women’s game. Barca coach Ernesto Valverde said recently that he could see a woman in charge of the men’s team soon, but ex-England international Kelly Smith told ESPN FC this week that she still believes “we’re a long way from that moment” at the top level of the game. “Women’s sport is changing all the time no matter what role you play, no matter what part you play in a football club women are getting a lot more opportunities which is really positive,” Duggan said. “For me, it’s the best person for the job. Whether you’re male or female is irrelevant.